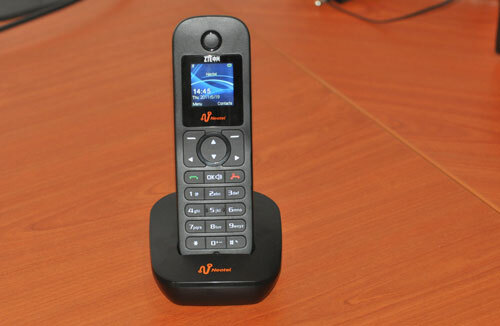 Neotel this week unveiled a new “fixed-wireless” handset aimed at the retail consumer market. TechCentral put the device, made by China’s ZTE, through its paces. The handset, which uses Neotel’s wireless code division multiple access (CDMA) network, is aimed at consumers who are looking for an alternative telephony solution to options available from Telkom. Unlike the company’s previous home phones, which have been big and clunky, the new phone, known as the ZTE WP850 and which costs R399, looks more like an entry-level cellphone. Built out of a solid chunk of black plastic, the device has a basic and small 96×96-pixel colour LCD screen, cleanly fashioned numeric keyboard and speaker on the rear. Because it’s lightweight and portable — it weighs no more than your average smartphone — it can be used anywhere in the same geographic calling area, provided there’s coverage. That means you can take it with you to the shops, or to your local restaurant. But don’t expect the sort of coverage you’d get from your mobile network operators, especially outside the cities. The Neotel offering has a number of clear advantages over fixed lines. Firstly, it’s wireless, so there’s no need to wait for a technician to install a line. Secondly, the tariffs are very reasonable — R1,08/minute to Vodacom and MTN in peak times and 34c/minute to Telkom phones. That’s a lot cheaper than using a mobile phone and cheaper than Telkom’s call rates. The phone can also be used to send SMSes, which cost 35c each. And off-peak calls to other Neotel users are free. The phone comes with polyphonic ringtones and a built-in address book. One big drawback, though: when its rechargeable battery runs low, it emits a ear-piercing warning that it needs to be plugged back into its charger (USB or mains) or into its bundled rocker, which connects to a wall socket. Don’t expect to be able to do anything fancy with the WP850, like tethering it to your laptop for data connectivity. It is aimed squarely at people looking for a voice solution that also allows them to do a bit of texting. TechCentral has three WP850 handsets, with bundled airtime, to give away to readers. E-mail us and tell us the name of the Chinese company that makes the new Neotel device. The third, fifth and seventh correct entries received will win. While you’re here, do follow us on Twitter for the latest technology news and analysis. Update: Congrats to our winners, Derick Hewetson, Byron Linsell and Neil Howieson. The competition is now closed. Very stylish compared to the Dupont. But if it can’t do internet, its no good for me. Nice Neotel it looks pretty awesome for a home phone! Love your work! now you must just bring some better neoflex packages with much more cap and reduce your price on it, because 8c per mb is very expensive for the average South African. You cant merely say that Neotel are expensive when the problem is SOUTH AFRICAN. My friend pays less than R200 a month in Glasgow for a 16MBIT CABLE uncapped. Here you pay more for just your service providers rental for 384KBIT lines…….its retarded.